I just bought these coasters for more than double the price. Yeah, I'm pissed off. (It's good that they look like they're worth around $30 or $40, though.) 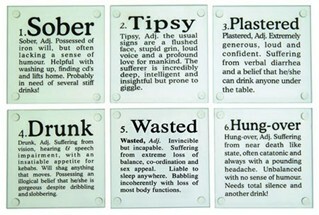 These are a great host/hostess gift for your friends who love to drink or have people over all the time. They also can be used as art. No, joke. The design store that I bought them from had them sitting on a couple of different console tables and they looked really artsy. They look chicer in person than in the photo. Hey, they'd even make a great gift for your famous friends! * New Link: Buy them here for a steal. Welcome back!! Love the coasters, unfortunately they were out of stock. OMG, I bought those a few years ago...then schlepped them to England as a gift...only to open them and find out the set was F'd up and there three "Tipsy." LOL. So funny we have such similar taste. Did you get them at Pulp?